Chinese e-commerce companies are beefing up payment and logistics services in countries and regions along China's "One Belt and One Road" (B&R) initiative, helping to both promote the government's plans for the initiative and expand the companies' own customer bases. Alibaba, through its global retail site AliExpress, has been among the most active companies expanding along the B&R. Alibaba founder Jack Ma Yun proposed creating a private-sector Electronic World Trade Platform to specifically support the initiative. But just because Chinese companies are eager to expand abroad doesn't mean that oversea countries are ready for them. Li Guibin remembers feeling both "excitement and anxiety" the first time his company sold products directly to Russian customers online. Li is Chief Operating Officer of the Beijing-based women's apparel company Zhong Ding Tai Feng. The year was 2015. Zhong Ding Tai Feng had received more than 2,000 orders from Russian buyers in the first hour of the "Double 11" mega sale on November 11 through AliExpress, Alibaba's global retail site. Li was excited about the volume of the sales, but anxious about their execution. It took more than an hour for many customers to pay for their purchases as a flood of orders paralyzed the shopping platform and overwhelmed Russia's banking system, Li told the Global Times on Wednesday. It was then that Li realized that some countries were unprepared for cross-border e-commerce. Since then, however, things have got better. In early 2016, Alibaba's in-house payment unit formed an alliance with the Russian bank VTB to offer a reliable shopping experience for Russian consumers. "Russia's banking system processed 15,000 of our orders without a hitch during 2016's Double 11 shopping festival," Li said. The figure was double the number of sales the system handled in 2015, he noted. The improvements in Russia are just some of the advances that Chinese e-commerce platforms have helped facilitate to smooth out transactions with countries and regions involved in China's "One Belt and One Road" (B&R) initiative. The B&R initiative span 65 countries and regions, connecting 4.4 billion people and representing about 40 percent of global GDP, according a report by the World Bank. In 2013, Chinese President Xi Jinping proposed the B&R initiative to create a trade and infrastructure network connecting Asia with Europe and Africa. AliExpress aims to build a "Cyber Silk Road" in line with the initiative, the company stated in a press release to the Global Times on April 10. Speaking at the St Petersburg International Economic Forum in Russia in 2016, Alibaba's founder Jack Ma Yun said the most important regions for his company were those along the B&R route. Apart from Russia, Alibaba has also formed partnerships with Kazakhstan, Singapore, Spain and countries in Southeast Asia to improve logistics and payment services. In early 2016, Ma proposed establishing an Electronic World Trade Platform (eWTP), which he called a private-sector initiative to support the B&R. In its latest step toward creating the eWTP, Alibaba announced on March 23 that it planned to set up its first digital free trade zone outside its home market in Malaysia. The digital free trade zone would, with support from the Malaysian government, seek to improve logistics and financial services to boost trade and e-commerce across borders. Alibaba's financial arm made an investment in Thailand's payment service provider Ascend Money in November 2016, about seven months after Alibaba became the biggest shareholder in Lazada, Southeast Asia's largest cross-border e-commerce platform. 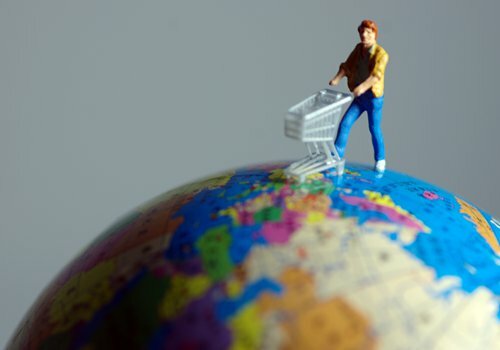 Another e-commerce company, JD.com Inc, China's second largest online retailer by sales, has also rolled out a globalization strategy in line with the B&R. Jd.com started by forging a tie-up with the Russia e-commerce company Ulmart in 2015. AliExpress hopes the B&R initiative will help it increase its customer base by an order of magnitude. The initiative will give AliExpress the momentum it needs to grow its number of global buyers to 1 billion, or 10 times its current customer base, in seven years, AliExpress general manager Shen Difan said on April 10 at a press conference in Alibaba's home city of Hangzhou, capital of East China's Zhejiang Province. The conference was attended by vendors from seven countries and regions, including Spain, Russia, Brazil and the UK. During the conference, Alfonso Noriega Gomez, economic and commercial counselor of the Consulate General of Spain in Shanghai, pointed out that Spain and China will have closer ties via the B&R initiative, and Spain wants to work with major e-commerce companies such as Alibaba so the initiative can reach its full potential. AliExpress has become the third largest online shopping platform in Spain, Gomez said. E-commerce could have a promising future in B&R countries in Southeast Asia, Central Asia and Russia, where the quality of traditional business infrastructure is low and local demand for low-cost goods is high, experts said. By comparison, it is difficult for Chinese e-commerce companies to breach the US market, where the retail industry is mature, Lu Zhenwang, founder of Shanghai Wanqing Commerce Consulting, told the Global Times on Wednesday. 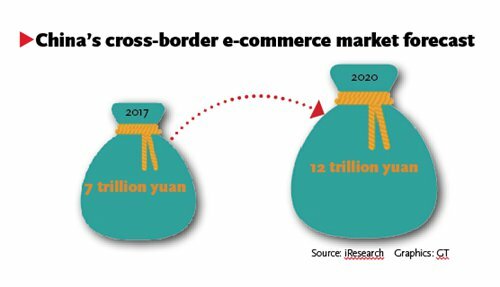 A report from the Beijing-based market research firm iResearch estimated that China's cross-border e-commerce market will exceed 7 trillion yuan ($1.01 trillion) in 2017 and grow up to 12 trillion yuan by 2020 under the B&R initiative. The overseas expansion of Chinese e-commerce platforms can benefit medium and small-sized businesses like Zhong Ding Tai Feng by improving their access to global markets, said Liu Dingding, an independent IT expert. Still, there are still challenges in many countries that need to be overcome for Chinese e-commerce to flourish overseas. Vijay Sharma, the founder of India's mobile payment tool Paytm, said in a press conference held in Shanghai in June 2016 that India's financial services are relatively undeveloped. For example, less that 20 percent of the population has a bank account. In addition to payment services, delivery is also seen as a challenge. Some residents in Russia have to wait about 15 days to receive their online purchase from China, Li said. In China, customers typically have to wait about three days. Still, there has been a great deal of improvement over the last few years. When AliExpress first entered Russia in 2012, it typically took 60 days for Russian customers to receive their goods, Hu Yanhui, AliExpress's operating director, stated in the press release. Russia's e-commerce ecosystem is still evolving, making it possible for any company to lead the market, so long as it can find the right local partners, Liu told the Global Times. Alibaba's rival Amazon.com reportedly plans to enter Southeast Asia via Singapore in 2017. In Li's mind, his company has many options besides AliExpress for reaching customers abroad. "We will choose the more established Amazon and eBay as partners to expand our presence in the EU market," Li said.